A planner, no matter how beautiful, won’t be much help if it isn’t set up for you to make every day your best day. 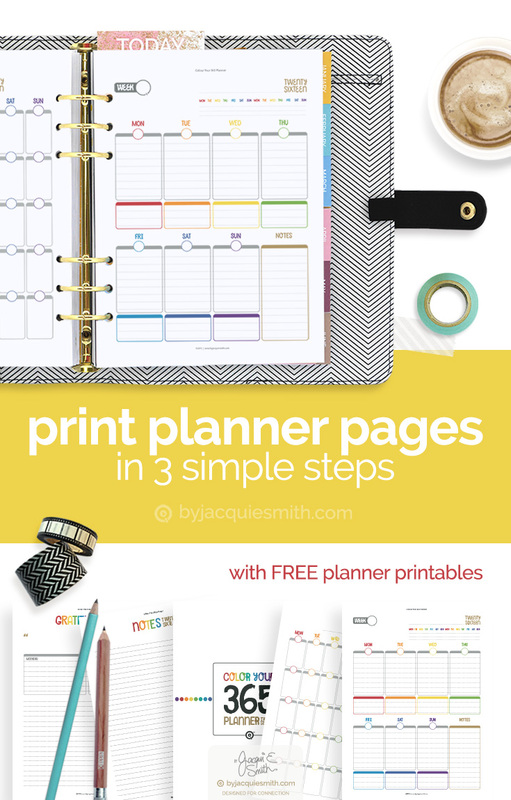 How to print planner pages … easy! Being able to design your day your way, I think is the secret to living your best life. Knowing how to print planner pages and customise your planner is key in being able to create an awesome day, everyday. This planner freedom is at the forefront of my mind in delivering the best planner printables to you. As a designer, it was important to consider how to best design planner printables so that they are easy for you to use, and that includes printing them. If you can simply + easily print planner pages you are halfway to designing your ideal day and living your best life, everyday! Whether your planner stays on your desk or travels with you as your constant companion + most loyal assistant, I have a size that will work for you. My FUSE:life digital planner printables come in three popular sizes while the Colour Your 365 printables are currently available in large only. For more information about planner binders + refills sizes check out my beginner guide article. We will use the Colour Your 365 planner pages + A5 paper to suit my Large Kikki K (A5) planner binder. I know that probably sound confusing mixing large with A5, it’s just the way Kikki K have named their planner sizes. With your planner + paper size chosen, let’s print the first side of your planner pages. # Tip: If you are just starting out creating your planner, don’t feel like you have to print a whole years worth of pages. You may find as you begin using your planner that you might like to try different page designs. Having the freedom to explore and learn what works best for you is one of the best things about creating your own planner. Let’s start with January and enough week pages for the month. Once you see the flow of how to print your planner pages, you simply repeat these steps to print all the pages you desire. With five weeks in January print 3 week pages. Count the weeks in the month and divide by two. If it is an odd number of weeks add one week and then divide. For tips on how to work this out, check out my Tips for Printing Planner Pages article. Let’s print the reverse side of the week pages, since that file is still open on your computer. # Tip: If you are wanting to print dated pages, or pages in a specific order, it is easiest to do so with all pages in one complete pdf file. Check out my How to Set Up + Print Planner Pages post. Trim your pages if needed, assemble your pages in order, hole punch + insert into your favourite binder. Now that you know how to print planner pages you are ready for an awesome + productive day! So how do I print a personal size? This is where I am 100% lost. Do I print on a normal sheet of paper and then trim? Or do I input that size of paper into my printer? And what settings need to be changed so it prints properly? Thank you!! Lelia, I’m so glad you asked. There are so many different planner sizes it can be overwhelming for sure. In the article under the section on Page Size I talk about how to print the three different sizes of planner pages I produce: Personal, Medium and Large. To print Personal Size you can either print the single page on an A5 or Half Letter sheet and trim to size, or you can print the 2up file included on A4 or Us Letter and trim to size. Hello Kandace 🙂 For the Classic size of the Happy Planner you can use the Colour Your 365 Planner Kits or Large FUSE:life and print the pages at about 85%.